I’m a huge fan of homemade pancakes. There is something almost nostalgic about flipping them in the pan and then slathering a whole stack of them with butter, but sometimes it’s just too much work. That’s why I love playing around with different baked pancake recipes. They aren’t exactly the same as cakes made on the griddle, but they’re a great time saver and are always delicious. Mornings are one of the busiest times of day for a lot of families and being able to mix up the batter and throw it in the oven is awesome for moms who like to serve up easy homemade meals. Step 1: Beat milk, oil, vanilla and egg in mixing bowl. Step 2: Mix in sugar. Step 3: Gradually mix in flour. Step 4: Mix in baking powder and salt. Step 5: Pour batter into greased 8×8 baking pan. Step 6: In separate bowl, mix sugar and cinnamon then sprinkle over batter. Step 8: Bake at 350 for 25 minutes. Beat milk, oil, vanilla and egg in mixing bowl. Mix in baking powder and salt. Pour batter into greased 8x8 baking pan. In separate bowl, mix sugar and cinnamon then sprinkle over batter. I am horrible at flipping pancakes,lol. I can't wait to try this out one Saturday morning! Haha. It definitely takes some practice to get it right! 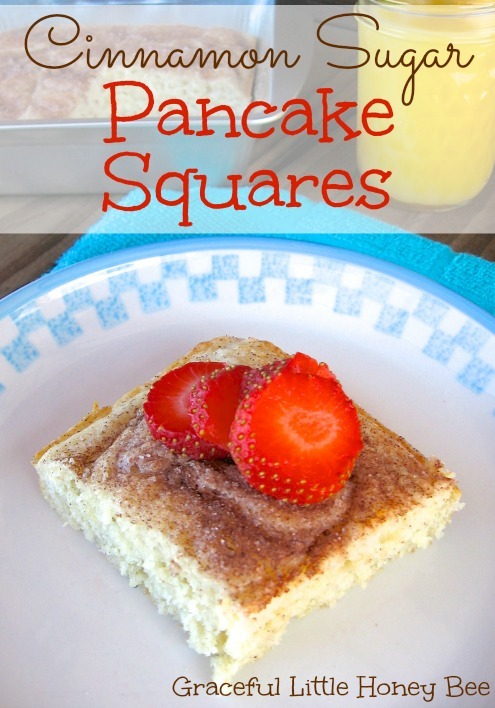 Can you believe that I only recently heard of pancake squares?! I like the looks of your cinnamon sugar topping. I would triple it. You will definitely need to increase the cooking time to 45 minutes or until the middle is cooked through. Have you ever tried them with pancake mix? Just wondering if you get the same results. I really enjoyed this recipie... but I found that it tasted like there was to much baking soda in it... did anyone else feel that way? I originally posted baking soda in the recipe, but it's supposed to be baking powder which is how it reads now. SORRY!! Try it again and I bet it will be WAYYY better. Just made this with a couple of substitutions (white whole wheat flour, unsweetened applesauce instead of oil and less than half the cinnamon sugar on top) and it is AMAZING. If you follow WW, those substitutions made each square 2 points. Incredible. This is going into regular rotation, so happy to have pancakes on a weekday! The picture looks better than the actual taste. It had no taste, and it leaves a weird after taste in your mouth, my family did not enjoy this at all. I wouldn't recommend it. Definitely would not make this again. I'm sorry you did not enjoy the recipe. Are you sure you used baking powder and not baking soda? If you get them mixed up then it tastes bitter which is NOT good. Every time I've made them they taste awesome! :) Have a great day! Quick, easy, and my kids devoured it! My only difference was baking for 18 minutes not 25...which I am attributing to the high altitude I live at. Thanks so much! We make this recipe, but instead of the cinnamon sugar topping we sprinkle frozen blueberries on top of the batter before baking. I am going to try the recipe with cinnamon sugar the next time I make it. It has always been a hit here. My kids love cinnamon and sugar, I can't wait to try this! Do you think substituting buttermilk for regular milk would work ok? I use buttermilk in our pancakes, and have some extra that I need to use up! I think it would probably be fine. This is great, thanks for sharing! I plan on making two pans: one to serve right away and one to freeze for quick weekday breakfast options.